SolargraphyGallery - How to get solargraphs from all over the world at different latitudes? How to get solargraphs from all over the world at different latitudes? 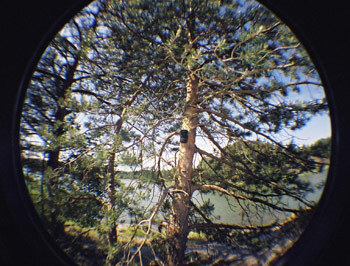 A pinhole camera = a can. An essential part of this method is the building of my own pinhole cameras. 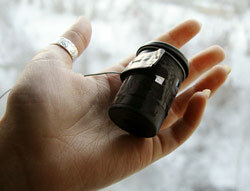 The cameras that are made out of empty cans / tins or film canisters are very practical. 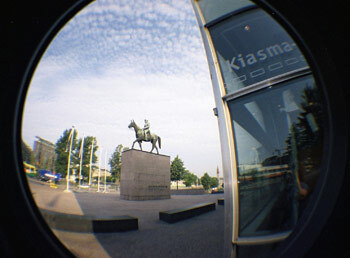 This kind of small black pinhole camera is excellent for the freedom it allows of placing the camera in the open air or in some public places in the city or for sending free pinhole cameras by post. At times I loose some of my pinhole cameras. That is an integral part of this kind of method. A monkey in Africa picked one up and after opening the canister became disappointed and threw it back onto the patio. Once in U.S.A a black bear woke up from it´s hibenation and distroyed the veranda where one of my pinholes had been fastened. Some curious people and security men have are amongst those that have ´stolen´ them. It`s bad to hear for your lost canister... But, I look at it this way. All your canisters, spread across the world, can be considered as a spiders web. The web is more holes than strings, but it catches enough food for a spider. And lost canisters are just holes in the web. Saved ones have enough "food" for your project!